Here is an easy and gorgeous craft project for the fall. I love the soft glow of luminaries in the fall. Luminaries are so enchanting and remind me of nighttime hayrides, cocoa and cozy over-sized sweaters. These paper bag fall luminaries are a quick an easy way to add a little bit of autumn magic to your home or to a classroom. My daughter’s favorite series of chapter books is the Captain Underpants series. In this series of books, there is a mini section called the Flip-o-rama. It is a mini flip book within the existing story. My daughter loves this and has made several flip books of her own over the last few months. We have played around with them quite a bit and they have become a little bit of an obsession in our house. They are just so much fun to make. With fall on the way, we had a little fun with some fall themed flip books and we just had to share them with you. We have included printable tree templates to help get you going. These would be great to use for all seasons. The fall is drawing near and this fall loving lady is thrilled. I love all things fall and am excited to be teaming up again with an amazing group of ladies to bring you our newest collection of black glue art for the fall. If you have never tried black glue art before, I suggest you try it. It is a wonderful exercise in hand-eye coordination and the results are bold and beautiful. 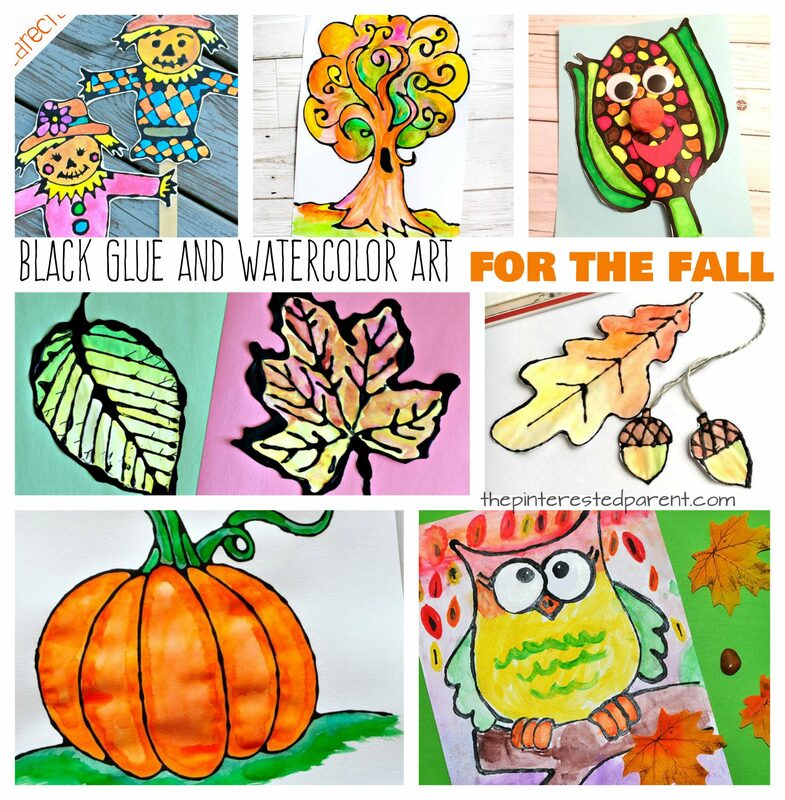 If you don’t believe me, just check out the gorgeous black glue fall art projects below and see for yourself. We are kind of excited about this simple crumpled newspaper fall tree craft. Corrugated cardboard is a favorite material of ours. The texture of the ridges in the cardboard adds a great feel to any project. I love the earthy look that the cardboard brings to the tree trunk. The crumpled newspaper was fun to work with and form and it added another element of texture to this pretty mixed media project. We love yarn. Sure, it is great for knitting and crocheting, but it can be used for so much more. There are many wonderful arts, crafts and activities that you can make using yarn. It is perfect for teaching sewing to beginners, for working on fine motor skills, for creating fun and unique craft projects and even making lovely pieces of process art. Here are just a few of our favorite yarn crafts and activities.